And Cut! 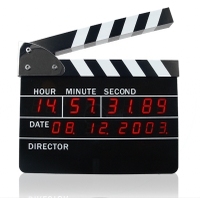 For all you aspiring directors, movie freaks, and people just interested in funky looking clocks, Chinavasion presents this director's clapperboard shaped alarm clock. Looking and acting exactly like a director digital slate, this cool looking desktop accessory displays the date, and the time all the way down to deci-seconds. Set the alarm to anytime you want, and when it rings, just like a director, use the clapper and clip the board just like you are beginning a film take, and the alarm stop (and action! ).